Delicious food can be fast! The Rapid Grill Series 4-Serving Electric Indoor Grill heats up 30% faster1 to deliver hot and tasty burgers, chicken, fish, Panini, vegetables, and more! Use the adjustable grilling angle to remove fat**, or lay it flat to toast sandwiches and grill vegetables! Plus, cleanup is fast thanks to the dishwasher-safe removable plates, featuring the Advanced George Tough™ nonstick coating that’s 3x more durable*. This electric indoor grill is a must-have for couples or small families who want easy, delicious meals—fast! Rapid Grill Series 4-Serving Removable Plate Electric Indoor Grill and Panini Press - Red is rated 4.8 out of 5 by 28. Rated 5 out of 5 by Roseann G from Love it! Some of my favorite features of the George Foreman Rapid Series Grill are:- a floating hinge to accommodate sandwiches and thicker meats with ease.- a faster pre-heat so you are not waiting around for it to heat up.- the non-stick cooking surface – clean up is a breeze.- the vertical storage for the convenience of leaving it on your kitchen counter.For cooking things like burgers or chicken that may contain fat and run they suggest that you flip the dual grill position stand outwards away from the grill. This will keep the juices and fat from running off the grill and making a mess on your counter. 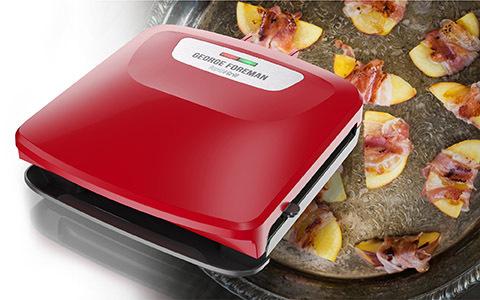 Of course you want to put the drip pan into place to catch any juices or fat that does roll off while using the grill.If you are on a diet or watching calories the George Foreman Rapid Series Grill will help you keep the fat out of your food. The unique tilted cooking surface makes sure that your food is not bathed in fat during the cooking process. Rated 5 out of 5 by stacey99960 from Great for lunch! So this is great for many reasons! It warms up super fast and I can make all sorts of hot sandwiches in between break time at work I have time to come home turn it on make a sandwich. Remove the plates and wash them & put them back all during break time. I highly recommend it! It saves counter space & the color is great in my RED kitchen! Rated 4 out of 5 by Rochelley from Great kitchen gadget! This grill is great for small and easy snacks or to grill some chicken to add to a salad quickly. I like how it is small enough to put away in a cabinet. Clean up is quick and easy! Rated 5 out of 5 by pcoop from A Must For Burgers I've used this product for a little over a month at this point and I love it! Nothing could be easier to use after a long day at work. Grilled cheese sandwiches are a breeze, and burgers cook quick without losing flavor. Cleanup is a snap! 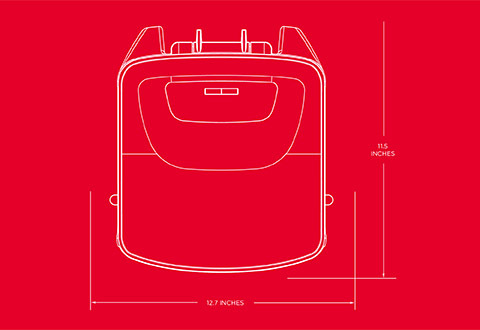 I also love how compact it is for storage. It fits perfectly in a cabinet without taking up a ton of room. I would definitely recommend this grill! Rated 5 out of 5 by jptheprez from Great for steaks & chicken I received the George Foreman Rapid grill series 4 serving with removable plates about 3 weeks ago and it is amazing. I love cooking a steak in 7 minutes , it does chicken perfectly. Perfect for the on the run bachelor or busy family, cooks food quickly and efficiently. The removable plates make a huge difference when it comes to clean up , they remove easily and can be put in the dishwasher or hand wash in the sink. Rated 5 out of 5 by Steph0312 from Great for grilling indoors This is great for people who love to grill out, but don't always tlhave the option due to weather or apartment living. Very easy to use. Removeable plate is great for easy cleaning. Rated 5 out of 5 by Becca83 from Works wonderfully My husband was more excited than me when this arrived for us to try! It looks great on the counter, does not take up to much space, easy to clean! Works quickly, and food taste amazing! We use it for bad weather days and the kids want hamburgers, or for a quick protein dish for us as we diet!